Roundabouts in South Australia might not be as mind-boggling as the ones you get in China – exhibit A above – but it doesn't have to be tricky. Our experts explain what to do in these six confusing roundabout situations. Q. I was taught to give way to the right when entering a roundabout, but I’ve heard this has changed. Is that correct? A: Despite what most of us were taught, the ‘give way to the right’ rule doesn’t apply at a roundabout. Rather, the law says you must give way to any vehicle, including bicycles in the roundabout. So in the picture above, car A must give way to car B. This doesn’t mean you should race to get to the dotted line first – all drivers need to slow down on approach and be prepared to give way and stop if necessary. It’s a good idea though to pay particular attention to traffic on your right, as there’s a good chance those vehicles will enter before you. Q. What should I do when there’s a long vehicle near me at a two-lane roundabout? A: When you’re in a long vehicle, it’s a tough ask to make a turn in a single lane. So these vehicles – if they have a ‘do not overtake turning vehicle’ sign displayed– can use two lanes to make a turn, if necessary and safe to do so. Take the picture above, for example. The truck is in the left lane, but is indicating to turn right – it can legally do this. Now, say you’re in car A: you should wait behind the truck until it’s driven through the roundabout. Don’t pull-up alongside it. Basically, driving past a long vehicle in a roundabout isn’t a great idea – and it’s against the road rules. Q. I’ve heard cyclists can turn right at a roundabout from the left lane. Is this true? A: Yes; cyclists can turn right from the left-hand lane of a roundabout. However, if a rider uses the left lane, they need to give way to any vehicles exiting the roundabout. This means when they get to point B in the picture above, they’ll need to slow down and let car A pass before continuing around. If you didn’t know this, you’re not alone. Nearly half our members got this wrong in a recent survey. Q. What’s the rule if there’s a cyclist next to me when I’m waiting to enter a roundabout? 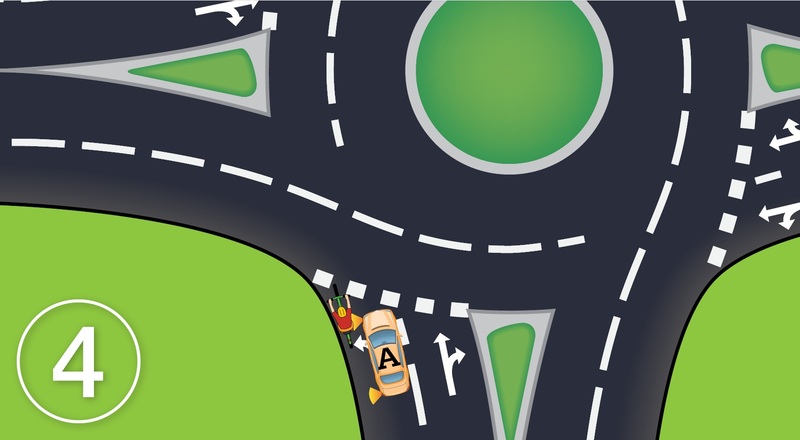 A: If you’re waiting to turn left at a roundabout – like in the picture above – and a cyclist pulls up alongside you, you need to wait for the cyclist to move before making the turn. This is still the case regardless of who got there first. However, if you’re already in the roundabout and are in the process of turning left when the cyclist gets there, they need to wait for you to finish the turn before going past you. Roundabouts are pretty dangerous spots for cyclists, so whatever the rule, keep an eye out for these road users and use some common courtesy. Q. Do I have to indicate when I’m leaving a roundabout? A: Yes, the road rules say you should indicate left whenever you’re exiting a roundabout. The only exception is if it’s not practical – say it’s a very small roundabout. So, if you’re turning right, like car B in the picture above, you should have your right blinker flashing as you enter, then switch to your left before you leave. One in four drivers got this rule wrong in a recent member survey. If you’re going straight through the roundabout, like car A in the picture above, then there’s no need to indicate on approach, but you should signal left before you exit. Remember: Keep an eye out for cyclists, motorbike riders and pedestrians though, as they can be hard to see at any intersection. Q. Do I have to indicate when entering a roundabout? 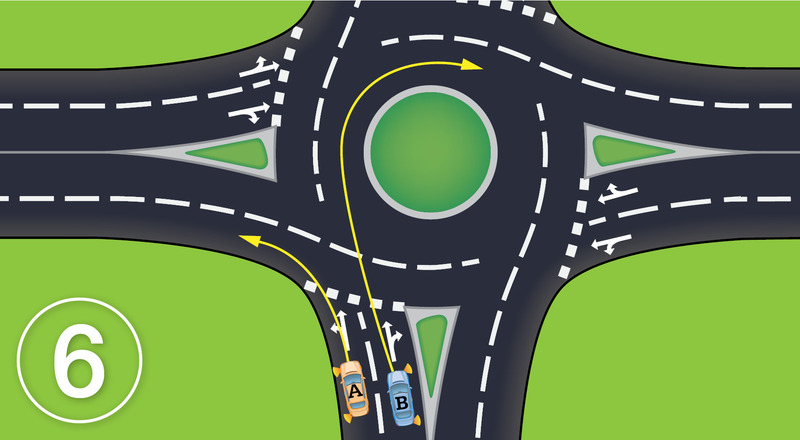 A: Yes – just as drivers have to indicate when they’re leaving a roundabout, they must also do so when entering one. For instance, if the driver is intending to leave the roundabout less than halfway around it, like car A turning left in the picture above, the driver must give sufficient warning before entering the roundabout. Similarly, if the driver intends to leave more than halfway around the roundabout, like car B turning right, the driver must also give sufficient warning by using their indicator to turn right.